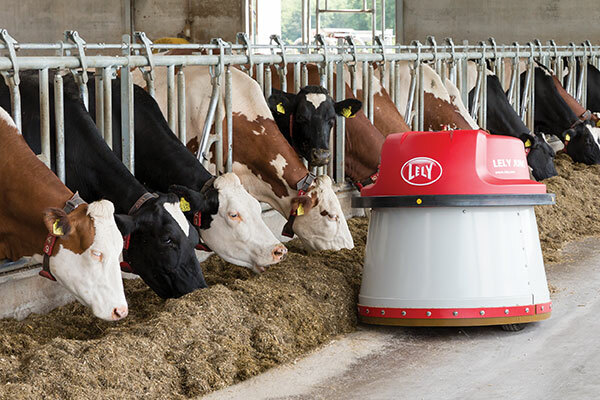 Home > New Pilot Incentive Program Targets Automatic Feed Pushers – Get a Lely Juno Today! The San Joaquin Valley Air Pollution Control District (SJVAPCD) has announced a new pilot incentive program to increase the installation of electric feed mixing equipment at Valley dairies, including Lely Juno automatic feed pushers. The program is designed to reduce diesel emissions from tractors and other mobile equipment and vehicles. The Lely Juno is an industry-leading automatic feed pusher with the ability to push feed throughout day. With integrated cleaning routes and the ability to open barn doors via Bluetooth, the Juno is a one-stop solution to dairy feeding. High milk production requires high feed intake, and the Juno provides cows with 24-hour access to feed, impacting rumen digestion, cow health, efficiency and production. This program will pay up to 75 percent of the total cost of equipment and infrastructure, up to a maximum cost effectiveness of $30,000 per ton of emissions reduced. Eligible entities are dairies and other confined animals facility operations which currently utilize diesel powered equipment to run their feeding operation. Projects will be selected for funding on a first-come, first-serve basis as determined by the application complete date. Due to the complexity of the program, it is recommended that interested applicants speak directly with SJVAPCD staff. Get more info, including the steps to apply here. Submission of a program application does not guarantee funding.